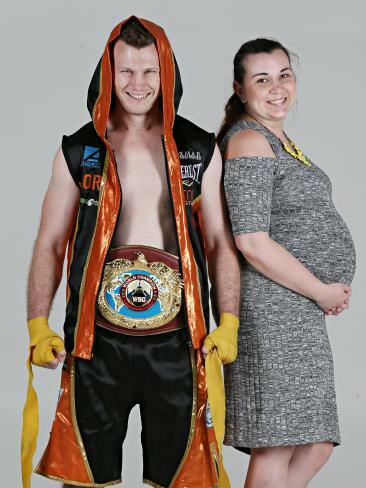 ONE of Australia's leading obstetricians will be ringside at Wednesday's world title fight in Brisbane in case Jeff Horn's heavily pregnant wife, Jo, goes into labour during the bout. 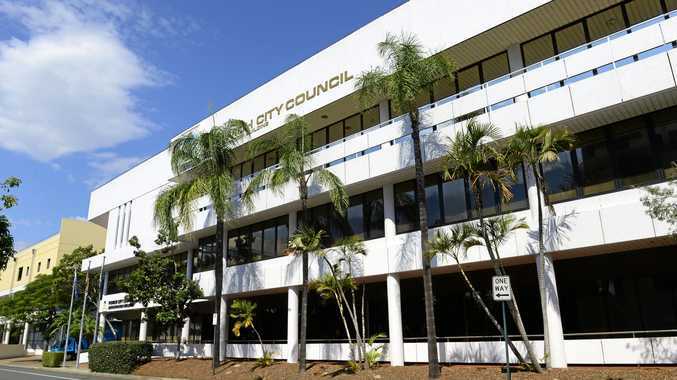 Dr Brad Robinson, from Greenslopes Private Hospital, said Jo would be in her 38th week of pregnancy, and that in her state of "advanced gestation'', she could go into labour during her husband's fight with English gypsy Gary Corcoran at the Brisbane Convention Centre. Jo is prepared for the emergency and says Dr Robinson will be on standby waiting for her to wave at him in case the baby girl - due on January 1 - decides to arrive early. "I'll be giving Brad the signal and letting him know if I start getting any labour pains,'' Jo said. Promoter Dean Lonergan said an ambulance would also be on standby to rush Jo to hospital if the excitement of the fight brings on her contractions. 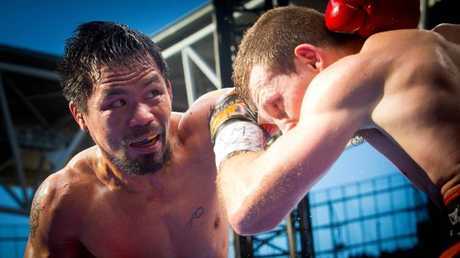 Horn, who is a heavy favourite to retain the WBO welterweight title he took from Manny Pacquiao before more than 51,000 people at Suncorp Stadium, said he was "prepared for anything'' on fight night. "If our little girl arrives on the night, it will only make me fight harder for my family,'' he said. Dr Robinson, who has delivered more than 2000 babies, said there was "probably a 30 per cent chance that Jo could go into labour this week'', and there was "a real possibility that it could happen during the fight''. "I'll be sitting somewhere close by to Jo in case she has to go to hospital,'' Dr Robinson said. "I've also told Jeff to get ready because it could happen anytime. "Jeff might even be spending the night before the fight in a maternity ward with his new daughter. Jo, 29, said there was "no way'' she was going to miss her husband's title defence, even though she is about to give birth for the first time. She said she was as nervous about him fighting as she was about going into labour. Jo has been Horn's No.1 fan since he took up boxing to defend himself against bullies in 2006. 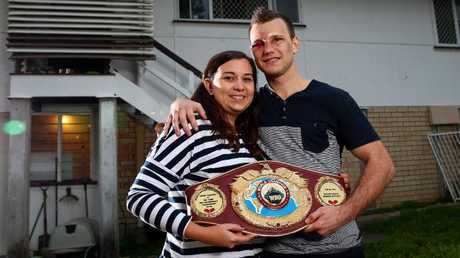 The pair, who were sweethearts at MacGregor State High School, live modestly in a small house in Acacia Ridge, but their lives have changed dramatically since Horn beat Pacquiao on July 2. Although he made just $45,000 from boxing purses in the last financial year, he is set to make more than 100 times that amount this financial year. Horn now has about $700,000 in the bank, and a lot more coming his way. He and Jo have been hunting for a house in the $1 million-plus bracket in Yeronga and Forestdale, but with the Corcoran fight looming and the baby about to arrive, they will be staying in their little Acacia Ridge house for the next few months. Not much has changed at their home, except there's a new pool in the backyard and a couple of cars from sponsors Sci-Fleet parked out front, including a bright yellow $235,000 Lexus LC500 sports car. "We're still the same people, and we always will be, but our lives are like a dream,'' Horn said. "We are getting invited to awards and dinners all the time. "We've had lunch at Government House, and Jo has to go to Woollies by herself because I get stopped for autographs all the time. "When I started out as a professional boxer, all I wanted to do was buy a nice house and have enough money for a comfortable life. "I still want to beat all the top champions, but my family will always be the most important thing to me. Jo has seen her husband morph from a shy, timid teenager into potentially one of the biggest earners in Australian sport. 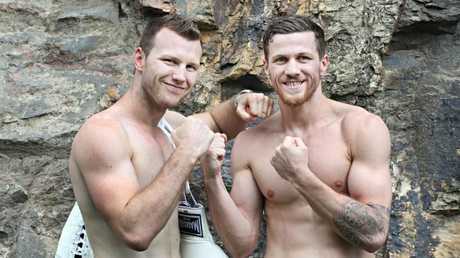 Horn earned $1 million for beating Pacquiao and will earn $1 million against Corcoran on Wednesday night. He has been guaranteed another $1 million for a fight with unbeaten American Terence Crawford in Las Vegas in April, although that payday could grow to as much as $4 million with a revised contract.